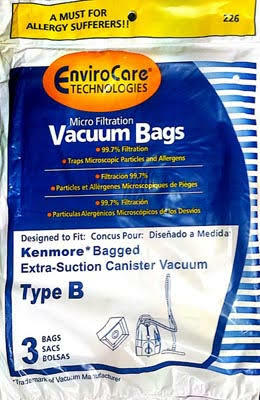 Does your Kenmore canister vacuum cleaner require the Style B vacuum bags? If so, eVacuumStore has just what you're looking for. The micro-filtration bags provide a durable storage location for dust and debris picked up while vacuuming. In addition to added durability, the increased filtration is sure to noticeably reduce asthma and allergy symptoms in those suffering from them. Stock up on Kenmore style B bags today and fend of the dust mites that dare enter your home.